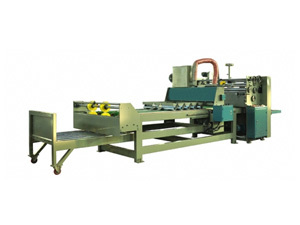 This gluing machine is a semi-automatic carton pasting equipment used for the final procedure of carton manufacturing. It is the necessary equipment for packing carton industry. This semi automatic carton pasting machine is suitable for the gluing of small and medium series of corrugated board boxes to varieties medium and small batches. Gluing machines produced in our company can be applied to food and cotton textile packing requirement. 1. These gluing machines have the advantages of high production efficiency, low labor intensity, simple operation, stable performance and reliable operation. 2. A motorized elevator table equipped on this gluing machine which can ease the blank introduction. 3. Semi automatic carton pasting machine has A VALCO glue application system. 4. In order to convey the box safely, a DICAR board transport wheel is used. As a professional supplier of gluing machines in CHINA, Shanghai Pripack Machinery Co., Ltd. has continually focused on providing a wide variety of paper processing, printing and packaging machinery for customers, such as paper cutter (A4 copy paper cutter wrapper/A4 paper cutting packaging machine), can printing machine (metal plate printing machine), flexographic press, hot foil stamping machine, die cutting, folder gluer, etc. With high quality assurance, our Semi automatic carton pasting machine are popular in markets including Ukraine, Russia period, Chile, Brazil, Argentina, Mexico, Malawi, Pakistan, South Africa, to name a few.